Now I already know anything on the Irish will be a hot topic for debate. But the past 20 years really have been about the rise and fall of the Notre Dame football program. If Notre Dame goes undefeated and misses out on a national championship shot this year, they will another undefeated team added to the staggering number of 13 teams that have fallen victim to the BCS system. The rise I am referring to isn’t during the tenure of Lou Holtz. Lou took the Irish to the 100 win mark over the course of 11 seasons from 86-96. The rise this article refers to is just after that. After back to back Cotton Bowl victories over Texas A&M in ’92 and ’93 they had a chance to keep it going in 1994. That season Notre Dame went 6-4-1 in the regular season and was still granted the opportunity to play in the Fiesta Bowl. The following and money that came with an Irish team is tough to ignore (note that the BCS wasn’t around at this point). The arguably unwarranted success (or unwarranted opportunities of success) is the rise before the crushing fall of the 2007-2012 Irish teams season. From 1994-2007, Notre Dame lost 9 straight bowl games, and yet throughout that time the team still played in 5 BCS games. Notre Dame won 57% of the games played in this stretch. In 2000, Notre Dame finished the year 9-2 and ranked 11 in the BCS standings. The Irish were chosen over the 10-1, Virginia Tech Hokies, for the Fiesta Bowl. Oregon State beat up on Notre Dame 41-9. They were ranked 18 the following preseason of 2001, went 5-6, and did not even reach a bowl game. The Irish were ranked 6 and 10 in the BCS standings in 2005 and 2006. Each year they lost their BCS bowl game. The Irish continued to get respect each year and chosen for the best bowl games in front of arguably better teams. While Notre was was going just over .500 over those five seasons the perception continued to rise throughout the time. Now the Notre Dame team that continued to get way too much credit is not getting enough and the perception is falling a little. The usually (arguably) weak schedules that would allow Notre Dame to amass 9 or 10 wins and a BCS bid is now hurting Notre Dame. Notre Dame is putting up great defensive numbers and the offense is finally starting to click, but the weaker than expected schedule is hurting The Irish. For once in a long, long time, the perception and rankings are NOT in favor of ND. Currently, the top 4 BCS ranked teams are undefeated. 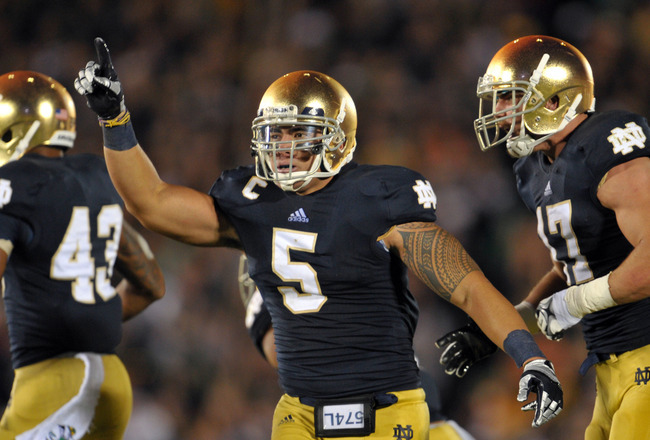 Preseason, the schedule for the Irish was one of the toughest in the nation. After beating everyone on the schedule so far, it is clear the teams they have beaten weren’t as good as advertised. Notre Dame no longer controls its own National Championship destiny. It’s time to bust out the luck o’ the Irish Notre Dame fans, and hope 2 top teams lose.